Presented by The Honourable Penelope Chetwode, 1961. Only the head remains of what was once a complete female figure in very high relief, probably part of a group. The face with its almond-shaped eyes and fleshy lips has the sensual calm, combined with a certain hard-edged quality, of Mathura Buddhas of c.450 A.D. except that the gaze is not downcast, with the consequent exaggeration of the upper lid. 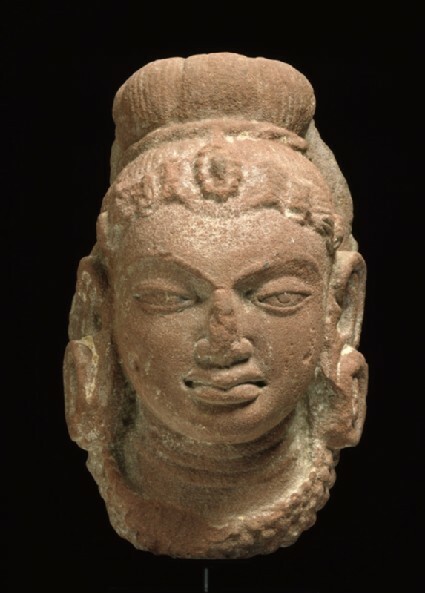 The headdress, on the other hand, belongs to the very end of the Gupta period (c.320-550 A.D.) or even the outset of the post-Gupta, as does the right ear-ring, its “bar” already taking the form of a little baluster.